Gan Allah Fulani Development Association of Nigeria (GAFDAN), a Fulani group, has blamed the prevailing hostilities in Benue State that have claimed scores of lives on “the enactment of draconian, repressive and peace-breaching laws targeted at the means of livelihood of over 18 million Fulani herdsmen in the country without regards to the consequences of such oppressive laws to the corporate existence of the country,” by the state government. In a statement signed by the National Secretary General and Board of Trustee (BoT) member of the association, Alhaji Sale Bayari, the group urged the federal government and the leadership of the National Assembly to immediately set up a high-powered committee to look into the deadly clashes between farmers and herdsmen in the country, which according to him, has the capacity to a cause a national security crisis. 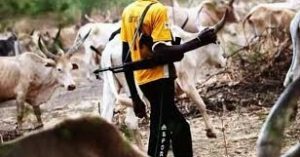 He observed: “There is a relative peace in Taraba State today despite the alleged killing of over 900 herdsmen on the Mambilla Plateau of Sardauna Local Government Area of the state between June 17 and 23, 2017, was because the association instituted a legal intervention by employing the services of a lawyer, Professor Yusuf Dankofa, who filed a suit against the Taraba State Government and the federal government at the ECOWAS Court and the International Criminal Court of Justice at the Hague respectively seeking justice for the victims.